On Friday, April 20th the ECJC convened the first-ever meeting of the Innovation Caucus to discuss the current state of entrepreneurship in Kansas. The Innovation Caucus is a group of pro-entrepreneurial, forward-thinking legislators with an interest in supporting entrepreneurship in Kansas. 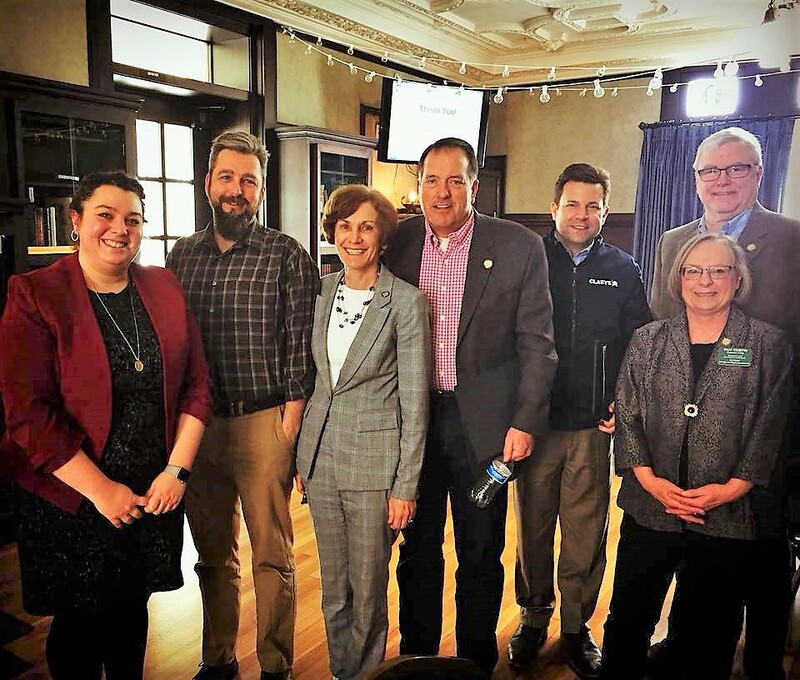 The attendees of the inaugural meeting of the Innovation Caucus were (from left to right): Rep. Jason Probst (D- Hutchinson), Sen. Barbara Bollier (R- Mission Hills), Rep. Dave Baker (R-Council Grove), Rep. J.R. Claeys (R-Salina), Rep. Jerry Stogsdill (D-Prairie Village), Rep. Pam Curtis (D- Kansas City), and Rep. Shannon Francis (R-Liberal, not pictured). The Innovation Caucus will serve as a forum for pro-entrepreneurial legislators to discuss barriers to entrepreneurship in Kansas and possible policy solutions to these barriers. The ECJC founded the Innovation Caucus as a part of the Ewing Marion Kauffman Foundation’s Entrepreneur’s Policy Network. As one of six organizations selected to form this network, the ECJC is working to identify barriers to entrepreneurship in Kansas and propose policy solutions. This public policy effort was developed in response to the Kauffman Foundation’s Zero Barriers Initiative to identify and remove policy barriers to entrepreneurship. The ECJC’s focus on policies impacting Kansas entrepreneurship aims to support and retain entrepreneurs in Kansas and ultimately make Kansas a leading state in entrepreneurship. At the first Innovation Caucus meeting, the current state of entrepreneurship in Kansas was discussed at length. Nationwide, it has been well-described that new businesses drive job creation. This is true in Kansas as it is across the rest of the country. Kansas is particularly reliant on small businesses, as 52% of Kansans are employed by small businesses. This reliance of Kansans on small or new businesses is high in central and western Kansas with most counties registering more than 62% employment by small businesses. As new businesses and small businesses drive and maintain employment in Kansas, the importance of supporting entrepreneurship cannot be overstated. However, firm formation and startup density has been on a precipitous decline in Kansas and across the nation for decades. Of the small businesses that do form, their share of scale-ups (ability to grow and employ 50+ people by their 10th year of operation) has dropped from 2% to 1.6% since 1987, indicating that the businesses which do form have an increasingly difficult time growing and creating jobs. Without intervention, the declining state of entrepreneurship could continue and have long-lasting, negative reverberations on the economy. Despite the relatively grim prognosis of entrepreneurship in Kansas, there are several factors in Kansas which suggest that bolstering the entrepreneurial ecosystem is possible with legislative support. Kansas is home to connected, highly motivated entrepreneurial support networks spanning across the state. The economic development community across Kansas is active and engaged. Communities across rural and urban areas alike are focusing on entrepreneurship initiatives and support structures such as incubators and training programs. Capital networks (such as the MidAmerica Angels investor network) are connected and active in injecting capital throughout the state. The economic development community is vibrant, effective, and hungry for additional support from the state and our legislation. The formation of the Innovation Caucus is just one of the initial steps that ECJC is taking to advocate for pro-entrepreneurial policies in the Kansas state legislature. If you’re interested in staying informed on the ECJC’s public policy initiative, sign up for our policy mailing list here. The Enterprise Center recently submitted testimony in support of HB 2767, a bill which would re-instate the Enterprise Zones program. The Enterprise Zones program creates a tax credit incentive for investments in small businesses located in non-metropolitan areas. The ECJC believes that the reinstatement of Enterprise Zones will improve entrepreneurship in Kansas by supporting small business and creating new jobs in rural areas. Read our letter of testimony to the House Appropriations Committee here. FAIRWAY, Kan. — (January 25, 2018) — The Mid-America Angels investment network (MAA) announced today that Laura McCoolidge Classen, formerly of Nebraska Angels, has joined as the group’s new Managing Director. The role was previously held for over a decade by Rick Vaughn, the group’s founding Managing Director. Vaughn will continue his involvement in MAA on a part-time basis going forward. Classen joins MAA after serving for five years as the Director of Nebraska Angels. During her tenure, the network invested over $13 million in early-stage companies and doubled in membership. Classen is also credited with founding the Midwest Angel Syndicate, a monthly forum for Midwest angel groups to improve deal flow. Under Vaughn’s leadership, the MAA network grew from inception to over 165 members and has deployed over $26 million in private capital to aid in the growth of regional early stage companies. Vaughn has led the network through a number of successful exits including EyeVerify (now Zoloz), Zave Networks, Rush Tracking, Rhythm Engineering, and Aratana Therapeutics among others. Most recently, Vaughn oversaw the network’s expansion to include three regional chapters in St. Joseph, Mo. ; Topeka, Kan.; and Manhattan, Kan.
Mid-America Angels, LLC is an angel investment network focused on early-stage companies in the Kansas and Missouri region. Since its inception in 2006, the angel group has made over 100 investments totaling more than $26 million. Individuals interested in more information about becoming a member of MAA or applying to pitch can visit www.midamericaangels.com. FAIRWAY, Kan. – (February 20, 2017) – The Mid-America Angels investment network (MAA) announced a $287,000 investment in Voxello, an Iowa-based medical device company. The company’s primary product, called the noddleTM, is a pioneering solution that detects voluntary gestures in hospitalized patients who would otherwise be unable to communicate. Today, the company also announced the U.S. Food and Drug Administration (FDA) 510(k) clearance of the noddleTM . This guest post by Sheila Seck originally appeared on the Seck & Associates blog. Are you entrepreneur material? You don’t have to quit your job to find out. Taking the leap from a more structured environment to freedom and responsibility of entrepreneurship isn’t easy. When I think back to the day that I made the decision to quit my job and start a business, one of the things I most desperately wanted was a way to test the waters. If you’re in the same state of mind, don’t worry. Today, there are a bevy of “startup intensives” that can give you the chance to try out the startup grind for a day, a weekend or a week at a time. These events, held frequently throughout the year, can help you decide if starting up is right for you. This guest blog post comes to us from Phil Singleton of Kansas City SEO, an ECJC workshop presenter. To hear more of Phil’s expertise, keep an eye on our upcoming classes for one of his SEO workshops! Just because you’re a startup doesn’t mean you can ignore Google or search engine optimization. The right SEO strategy can propel your business to unimaginable heights. Yet, tf you don’t have the right strategy early on, SEO is going to be an infuriating process. This blog post will clarify the process of creating such a strategy. We’ll go through exactly what you need to do to create a winning outcome. By the end of this article you should know what needs to be done, and in what order.